Small houses today are very attractive to modern homeowners. Because of their compact sizes and affordable prices, it's perfectly suitable for properties of all sizes and people from all walks of life. Today, there are a large variety of styles and designs of small houses. 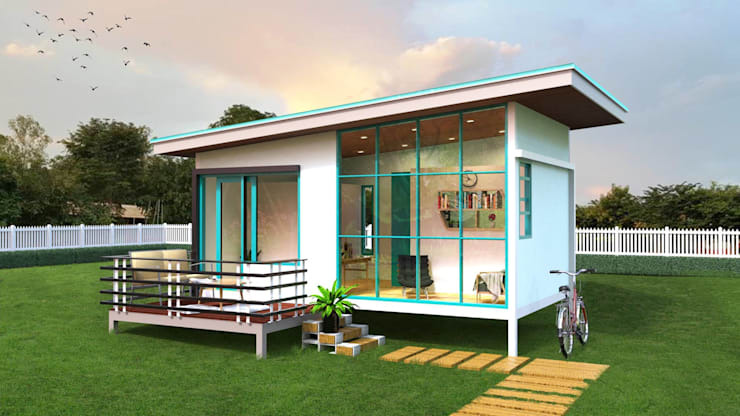 Whether you choose a one-storey building built with beautiful and durable materials, these compact homes will take no time to build as well as save both labor and construction costs. Not to mention, these homes are great choices in the face off the constantly fluctuating economy that continuously drives land prices day by day. A mini house is the perfect choice in this modern society. 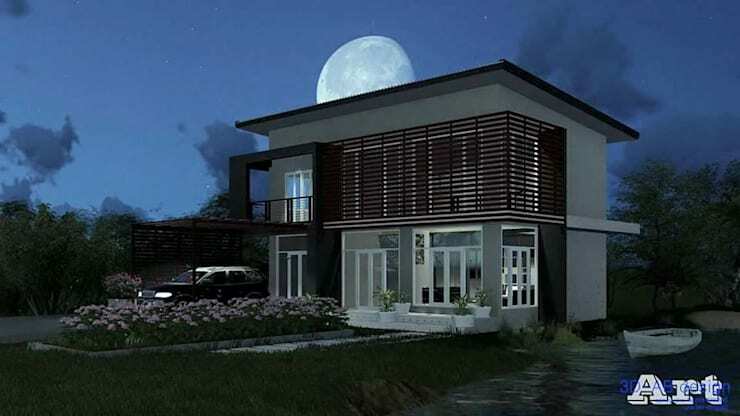 Homify is the leader in home design and improvement solutions, and we want to present you with a variety stylish compact houses designed for the modern homeowner to inspire you in your search for your dream home. This mini square-shaped two-storey house was created by designers from London, 3D-ABDESIGN. Built with precast concrete materials because it's easy to use but strong and durable. It also offers flexible design options due to its light grayish shades. The colors used in this beautiful home gives off a contemporary vibe while the classic windows and doors with clear glass helps open up the interior to the outdoor space providing a relaxing atmosphere. The front of the second floor has a balcony, where you can enjoy the beautiful views of the surrounding natural environment. The open parking space located at the front of the first floor can comfortably accommodate two cars for faster travel. This detached house is fully equipped with a gorgeous and relaxing living space which expresses its focus on simplicity with style. 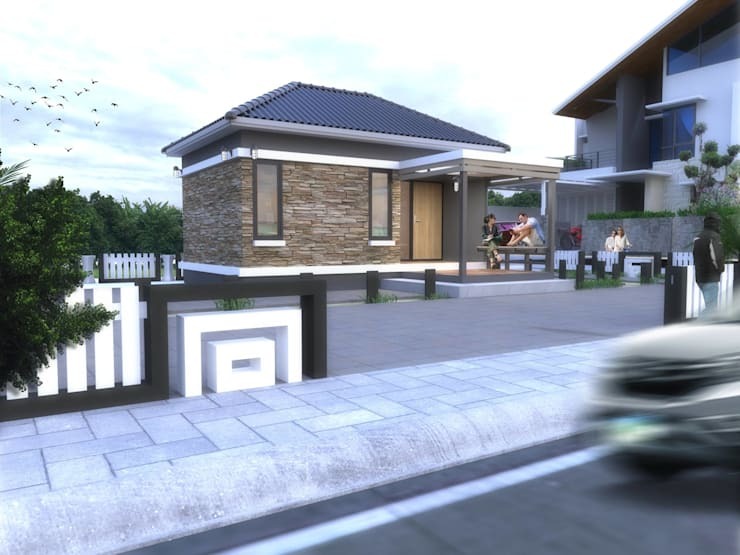 This single storey mini home is another creative design created by 3D-ABDESIGN which puts an emphasis on geometric shapes, reflecting an avant-garde style. 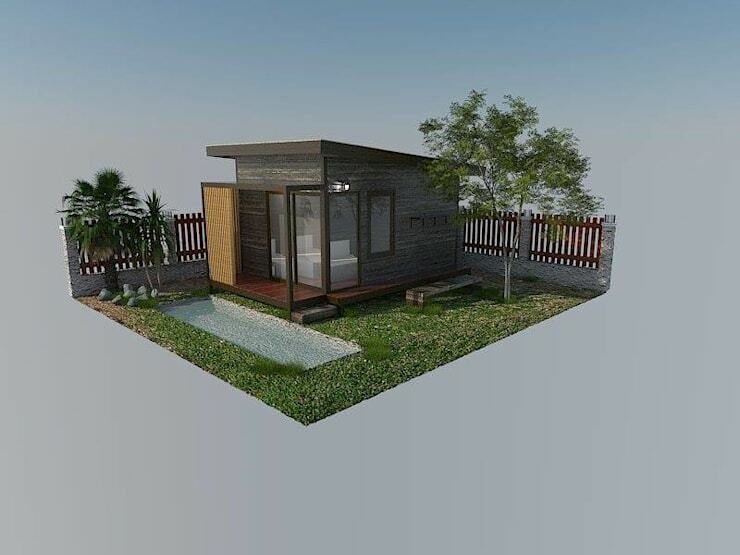 This compact house is perfect for two people and suitable to even the smallest patches of land. The main building materials used are all lacquers, which are strong, aesthetically pleasing and resistant to all weather conditions as well as termite infestations. The doors and windows utilizes a switch mechanism that helps obscure the view of the interior of the house. The clear glass panels help let in natural light to enhance the luminosity of the indoor space. The entrance is also designed with a compact walkway and patio to make the house more inviting. The security of the surrounding outdoor area is reinforced with a fence around 1.5 meters high which utilizes mostly wood and other natural materials like bricks. The rest of the outdoor area is a green space with vibrant natural colors. This single-storey house just exudes a unique and expressive modern style with a distinctive roof that just catches the eye. The modern styling of the house is evident at first glance which is then anchored in by the rectangular shape of the space that's mainly built out of concrete. The front wall is decorated with cler glass to enhance the indoor lighting by letting natural light in providing an airy, open atmosphere to the interior. The palette mixes shades of white and black giving this compact house a tasteful and refreshing feel. The outdoor space by the entrance features a paved walkway utilizing concrete pavement which can also serve as a parking space for your car. Near the walkway the surrounding area is filled with grass and perennials to refine the space and bring shade, fresh air and a more relaxing atmosphere. 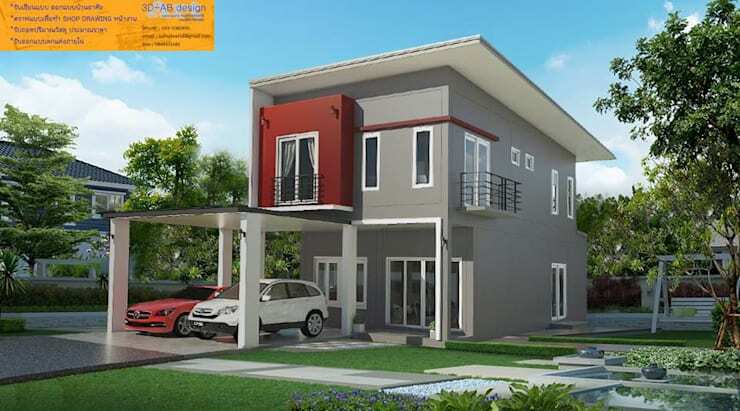 Another contribution made by Thai designers is this compact modern home style featuring a distinctive roof that resembles that of a dog house. This beautiful style helps strengthen the structure by making it easier to drain water from the roof while providing ample shade to its inhabitants. The main building material used is wood painted with eye-catching shades of green and white, as well as the natural colors of the wood itself. The glass walls, doors and windows of the house bring natural light into the interiors making the indoor space brighter. The entrance features a paved walkway utilizing small rock slabs that you can walk on to make this mini house more welcoming. In addition, the entrance also has a patio to enable you and your guests to sit back relax and enjoy the lush garden surrounding your outdoor space. This one-storey home stands out for the natural beauty of its building materials especially the bricks. The brick not only makes the space aesthetically pleasing, it's also strong and durable. The colors of each brick used for this project has its own unique shade which makes it look more natural, giving it that warm and cozy feel. The price is not significantly high and is suitable for people with a reasonable construction budget. For the roof, choose a design that's not just beautiful but can also protect you from the environment. The massive outdoor area of this house can be secured with a fence and the space can be used for parking or converted into a multipurpose yard. The front of the house also features protruding porch where you can sit and relax. After all, expanding your living space is one of the many advantages of designing a small home. This rectangular detached house is both simple and compact. Its shape expresses a more modern style built with precast concrete known for its versatility and strength as well as its natural shades of gray. The wooden battens that decorate the surrounding of the outdoor space adds aesthetically pleasing elements that helps soften the hard-edged design of the structure. The doors and windows have clear glass with a secure locking mechanism. The front of the house features a parking space and a balcony where you can relax and enjoy the view. The outdoor garden is filled with various species of flora, that not only add color to your space but also provides fresh air. In addition, the lagoon located by the side of the structure helps cool the house reducing the temperature inside as well as adding to delightful view. These small houses express creative design and a clear understanding of the modern Thai lifestyle. However, if you love the design of these Thai architects, remember the name 3D-ABDESIGN. It's one way to finally achieve your dream home.